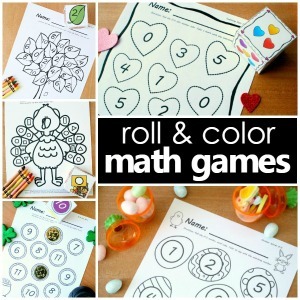 Prior to starting my own blog there were a handful of blogs that I read regularly, and Teach Preschool was one of them. I loved that I always found helpful and practical advice that I could use right away, both as a teacher and mother. After almost a year of blogging I’ve grown to respect the author, Deborah J. Stewart, MEd, even more. Honestly there have been many times when I wished I could be an observer in Deborah’s classroom or enroll my own kids there. While that isn’t an option for me, I was really excited to hear that she’s sharing some of her vast knowledge in the brand-new book Ready for Kindergarten! 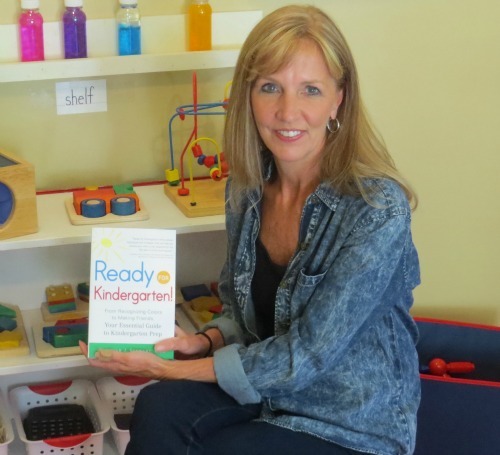 And when I heard about the opportunity to partner with Deborah and review the book and share some of the great details with you as part of the Ready for Kindergarten blog book study with other kid bloggers, I thought you’d be just as excited, too! Lovey is 4 this year and will begin kindergarten next year, so this blog book study came along at the perfect time for us. Even though I taught kindergarten for six years, I still feel like there is so much variation in the expectations for kindergarten readiness. Whether Lovey goes to school at home or in a classroom, I want her to be prepared. Deborah’s book is full of meaningful, simple, and age-appropriate activities and tips that can be easily incorporated into our daily lives. 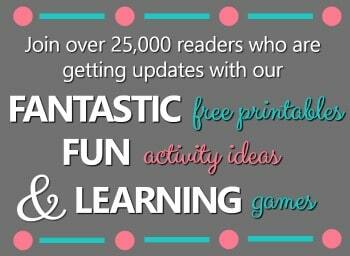 It is also very easy to read and helpful whether you are a teacher or a parent. For the book study I chose to write about the “I am an Artist” section in Chapter 17. 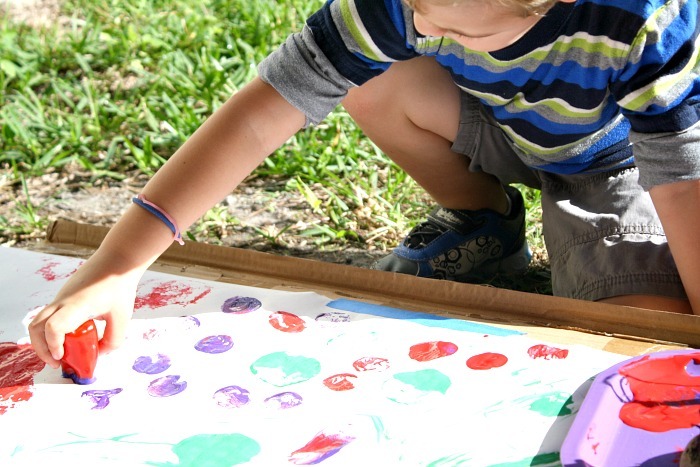 I fully agree with Deborah’s statement that “young children are natural artists.” As parents and caregivers we have a wonderful opportunity to encourage their curiosity and creativity through the use of various open-ended art experiences. If you follow this blog, you know we like to set aside our paint brushes from time to time and explore painting with other materials. The kids love experimenting with different ways to use the materials, and I am always inspired by how creative they are. 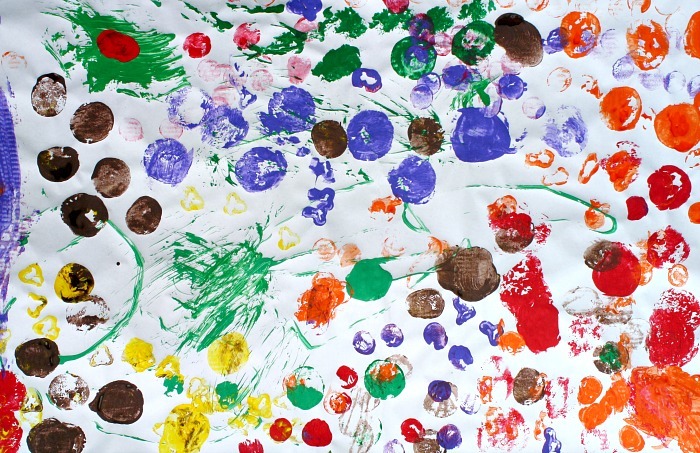 Some of our favorites have been painting with rocks, flower petals, pine needles and pom poms. For our vegetable theme we decided to paint with vegetables. Each morning throughout our vegetable week the kids went “shopping” at our pretend play vegetable stand. Their task was to shop for vegetables of the same color. Before shopping they would decide what color they were shopping for that day. This helped practice color recognition, decision making, and team work. Once the kids collected their vegetables we talked about the names of the vegetables and some ways we like to eat them. Then I took a small piece of each vegetable (just enough to paint with), and set the rest aside for tasting and eating later. We used a large section of paper from our craft roll and taped it to cardboard so we could move it inside overnight. Each different vegetable inspired the kids to paint in different ways. 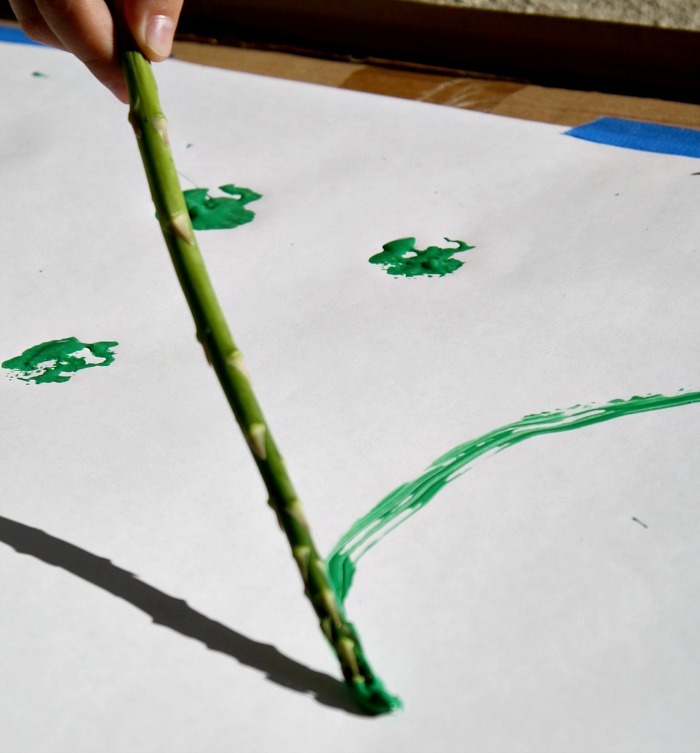 There was the asparagus paint brush that then turned into a rolling brush on its side. Broccoli florets became little stamps. Each morning the kids selected a new color and gathered the vegetables. Each day their excitement grew for adding new elements to their painting. They became more and more thoughtful about the techniques they were using and how they could experiment with the vegetables to make different designs on the paper. By the end of the week we had worked through almost all of the vegetables from our vegetable stand. By doing this activity over the course of a week each different paint color dried and the end result was a beautiful layered look that reflected all of the different colors we used. 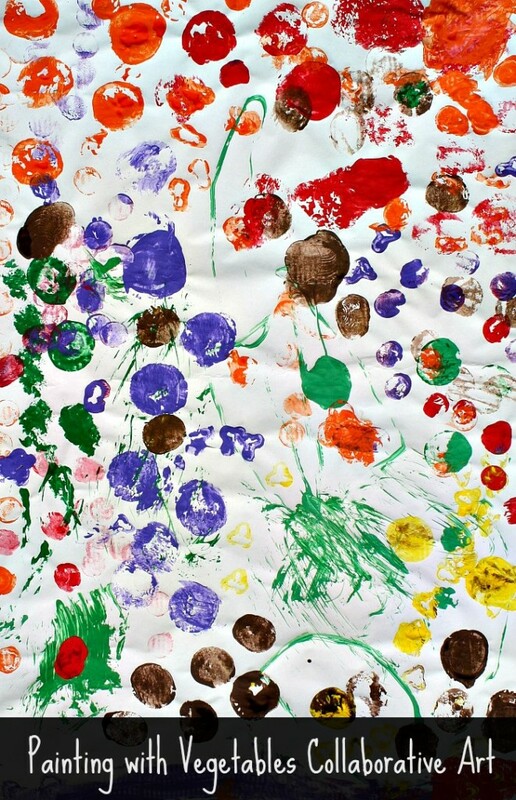 The kids’ giant art work was proudly on display for quite a while after vegetable week, and it’s right up with there with their rock masterpiece as one of my personal favorites for the year. I love when a art project leads to so much learning, creativity, and fun, and this piece is a reminder of all of those elements from the week! 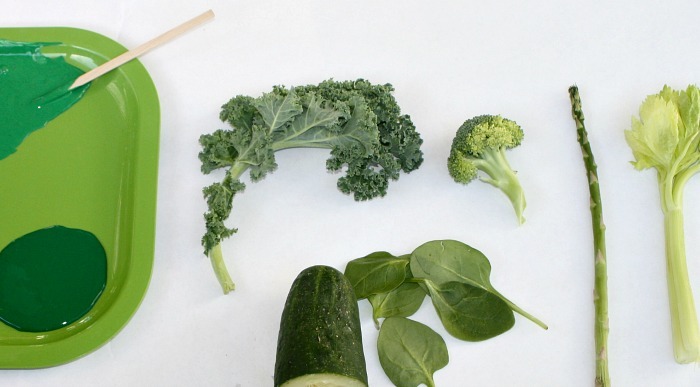 Want to focus on just one vegetable? 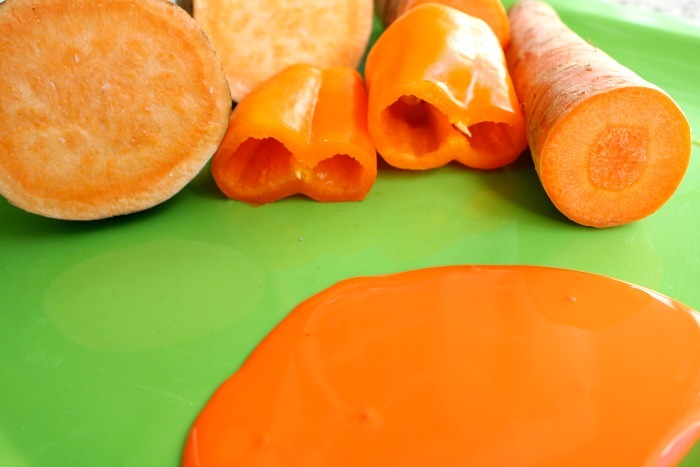 Check out these three creative ways to paint with carrots. 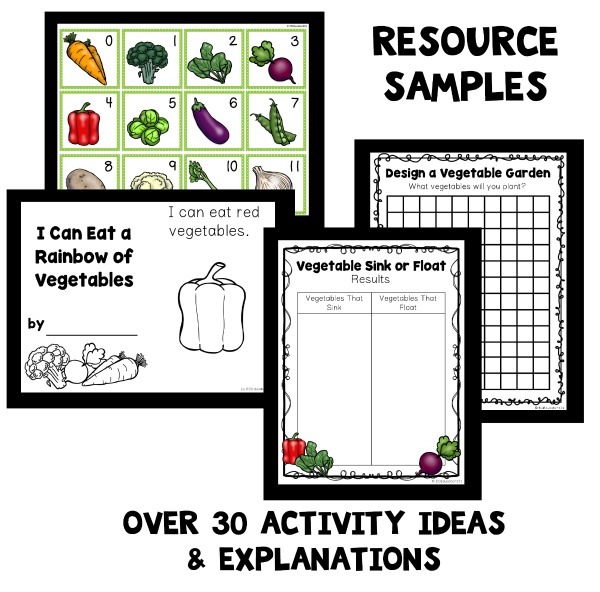 You might also like this awesome version of painting with vegetables over at A Mom with a Lesson Plan. 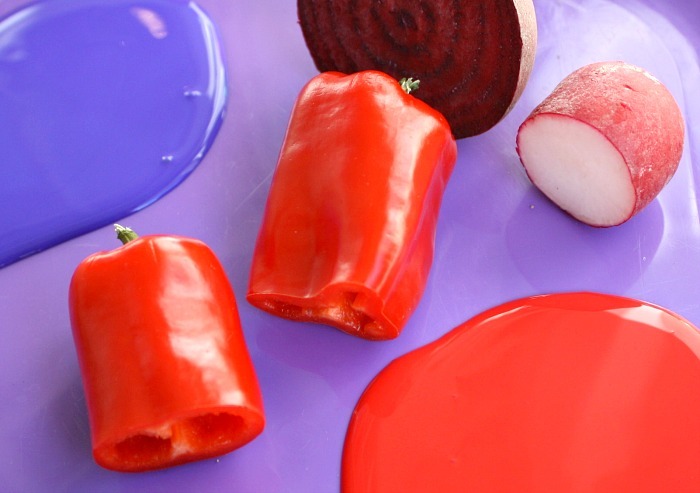 They even used vegetables to make their own paint. 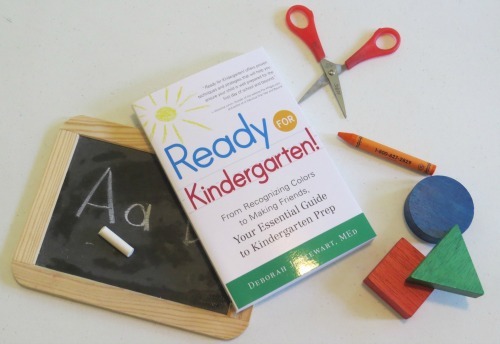 You can find out more about Ready for Kindergarten and see what the other participants in the book study are sharing to illustrate the topics in the book by visiting Teach Preschool. As A lover of art, education and vegetables I must say this activity is sickening. First, only someone who has never had to think of the needs of others would cover perfectly good food in paint. Second what exactly does this teach our children? That its OK to waste food to make some lame cookie cutter “art” project? Next time eat the vegetables. There are certainly varying opinions on the use of food for art and educational projects, and I do respect your opinion, Jordan. However, I would ask that you read carefully before commenting and be kind with your words. I certainly do not advocate wasting food. And as a former teacher in a low income school I know well about the needs of others and about childhood hunger. In fact in the classroom we often used activities much like this one as an “educational” way to provide a healthy snack for kids who otherwise did not have healthy options available to them. And if you read the post thoroughly you would have noticed that we used very small portions of the vegetables for painting and did actually eat the vegetables. Aside from the small portions cut for painting, a lot of the actual food was used for tasting and other cooking activities. It actually encouraged the kids to try some foods that they would never have tried if simply placed on their plates. And the kids explored many different ways to paint and use the materials we painted with. It was far from a cookie cutter art project. the colour coordination and the use of the veg stick for painting was wonderful. lovely ideas indeed! Shaunna, I love everything about this!!! Love that it was a collaborative project and that it was done over the course of a week. Also the pic of the veggies and paint are gorgeous. I so want to do this at our house. Thanks for sharing such a fabulous art activity! Thank you, Ann! I really love how the project developed throughout the week. I hope you guys get to try it out. 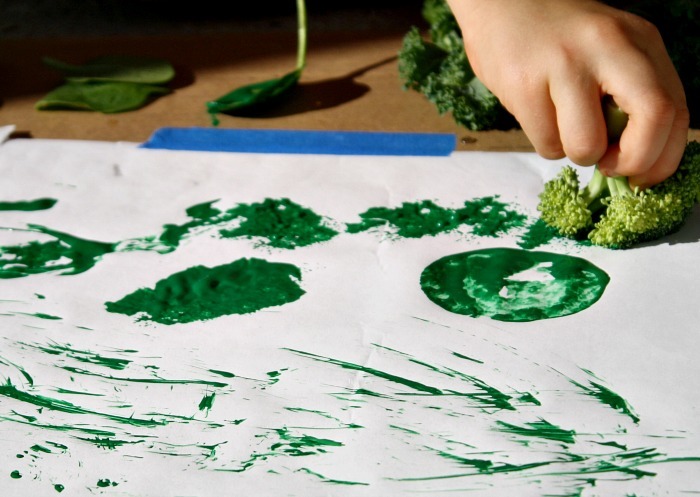 We used to print and paint with vegetables a lot when I taught toddler art classes, but I love your idea of using one color at a time and extending the project over multiple days. I’m going to try this with my kids! It is such a classic activity, but I agree-the simple twist made it a very different process for the kids. I hope your kids enjoy it! Looks like a fun activity. 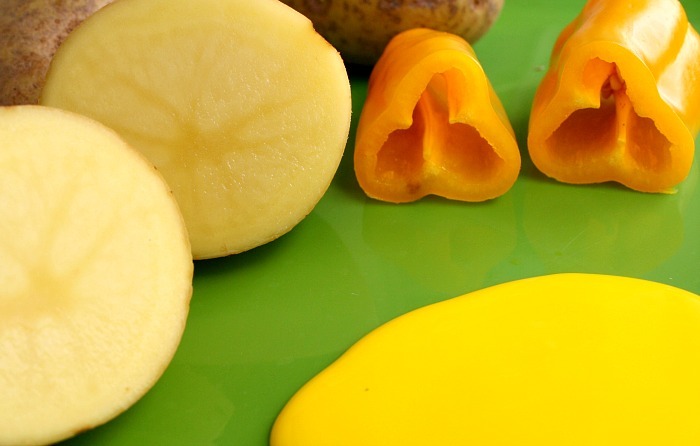 I have had the kiddos use potatoes for stamping put not for painting. Will have to try this soon. It was neat to see how they chose to paint with each vegetable. Sometimes they surprised me with their methods. I hope you have fun trying it out.